After a shaky start to the season, winning just two from their first six games, a superb run of form with four consecutive victories has seen them elevated to third spot in a competitive top half of the table. In contrast it was been poor opening nine rounds for the Salford Red Devils who find themselves in ninth spot with three wins from nine games, but two wins in the last four outings. Nial Evalds was out for Salford with Mark Flanagan back in the side after missing the defeat at Leeds on Easter Monday. The Wolves had the same starting thirteen that beat Castleford last time out. Ryan Atkins was on the bench in place of the injured ex-Devil Ben Murdoch-Masila. The pundits were favouring another Warrington win but on a rare apparance in front of the SKY TV cameras would be an extra incentive for the Red Devils. Warrington drew first blood when Toby King took a Josh Charnley pass inside and ducked under the covering tackler to ground on the line. Stefan Ratchford was unable to add the extras from wide right. The Wolves second was a simple walk-in for Charnley on eleven when he took a Ratchford miss-out pass and rounded closer to the sticks. Ratchford was again off target with a simpler conversion. On twenty-two Tyrone Roberts made the most of Salford confusion when they allowed his high kick to bounce which was then palmed back by Lineham into his hands for a second walk in try. Ratchford was able to convert his third attempt of the afternoon for 14-0 and there was already clear daylight between the sides. On twenty-six Robert Lui made the most of a penalty when he took a short inside pass from Weller Hauraki to to go fifteen metres pushing off the Wolves tacklers to score. He added the extras himself to narrow the margin to eight. After being under the cosh in the early stages it was the Red Devils who finished the half in control and with some hope for the second half. Jake Bibby missed a gilt edged change for Salford when he was unable to pick up a Lui pass off his toes with the touchline begging on fifty-four. On the hour mark Weller Hauraki had a try ruled out for an obstruction and the on sixty-five Junior Sa’u went close before forcing the drop out. 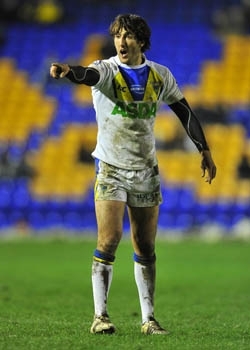 Kevin Brown sealed the Warrington win on seventy-three after taking a Ratchford pass five from the line to go over. Ratchford added the conversion for 20-6. Ratchford kicked a seventy-seventh minute penalty goal to extend the lead to 22-6 and lift his side into second place, at least for the next two hours. It wasn’t the prettiest of games and at times was downright scrappy. Both sides looked tired an low on confidence but it was the Wolves who made the most of their opportunities and secured the win. There were some bright points for Salford and they are a far better side than last season but must still be favourites to find themselves in the middle eights come the split. Warrington have still a distance to go to become the finshed article but they are on the right path. Devils: Lui (T, G), Olpherts, Sa’u, Welham, Bibby, Shorrocks, Littlejohn, Mossop, Wood, Kopczak, Jones, Hauraki, Flanagan. Subs: Tasi, Lannon, Burgess, Nakubuwai. Wolves: Ratchford (3G), Lineham, Goodwin, King T (T), Charnley (T), Brown (T), Roberts (T), Hill, Clark, Cooper, Currie, Hughes, Westwood. Subs: Crosby, Atkins, Philbin, Akauola.